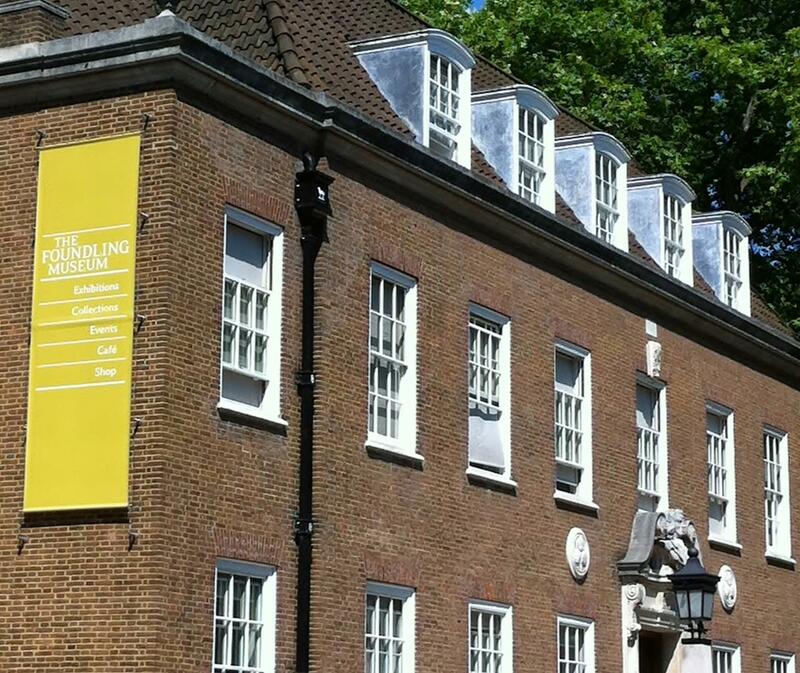 This museum is bordered by a park where adults can go, only if accompanied by a child. I emerged from Russell square tube station with a mission. A good friend in the antique dealing community had told me about a museum that had a very interesting collection of tokens and coins. Very dry stuff for one not actively involved in this academic world but bear with me. What really caught my attention was the fact that this museum was bordered by a park where adults can go, only if accompanied by a child. Unusual as normally the other way round makes more sense. The child within was stirred into discovering more. Out of the station and two blocks away is this playground covering seven acres. The sun was shining and hundreds of kids were out and about enjoying themselves. Known as Coram’s Fields this is a park that occupies the former site of the Foundling Hospital that was established by Thomas Coram. 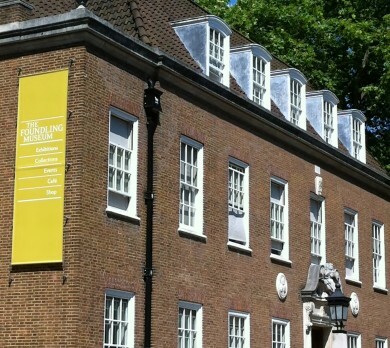 As much as the child within wanted to go and eat ice cream while basking in the summer sun, his grown up conscience directed him towards the Foundling Museum. This is situated at Brunswick Square and illustrates the history of the original Foundling Hospital. The Hospital was established in 1739 by a sea captain, Thomas Coram who on returning from America in 1719 was so morally outraged by the number of abandoned babies left to die on the streets of London. Over the next twenty years he persisted to raise the plight of these babies and finance needed to open this hospital. It was here that babies who were abandoned were given the opportunity of life and became known as ‘foundlings’. Many mothers reluctant to give up their babies were forced into doing so due to illegitimacy, age, social norms or simply being too poor. On the first floor are two show cabinets that house the token collection. These tokens either coins, ribbon, pieces of fabric, shells and even bits of paper were left with the babies. They were markers to be used by the parents in identifying their children if and when a time came when they were able to reclaim them. As I stood and looked at this collection I was blown away by the fact that each token represented a child never claimed and it left a deep impression. On the brighter side were the photos of a man who passed through these doors and sent back photos of himself with his wife and children showing the success that was achieved. Not to be missed when in London especially if you have kids who do not seem to appreciate all of the hard work you do as a parent. Thinking about foundlings my mind jumped to yearlings, horses with all the promise of a life ahead and many of them in the paddocks on the farms surrounding Franschhoek as I write this. 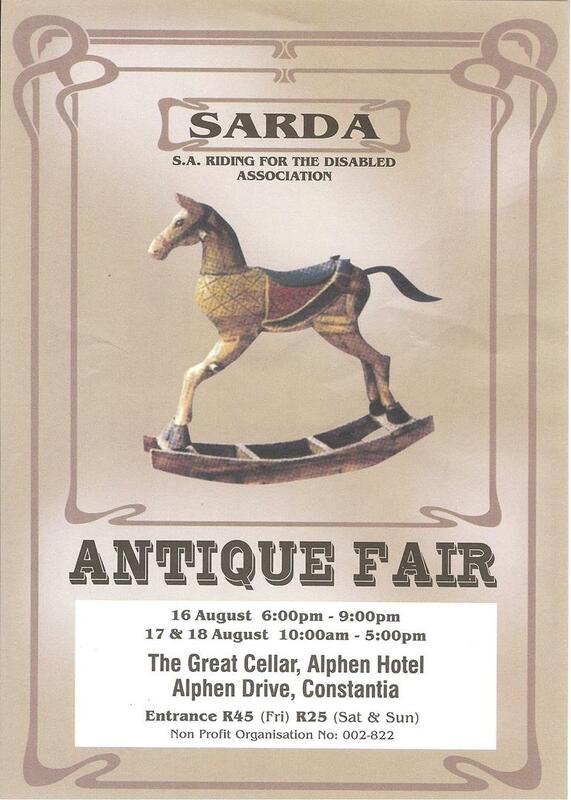 On this ‘horsey’ note this weekend sees the annual antique fair in Cape Town run by the South African Riding for the Disabled Association (SARDA). As their home page shows in three images “one, two, free”, the ability for a disabled person to ride a horse frees them from their physical constraints and one can only imagine what that must mean. 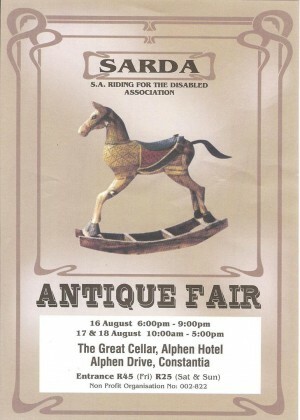 The fair held at The Great Cellar at the Alphen Hotel in Constantia opens with a cocktail party this Friday the 16th of August and is then open on Saturday and Sunday from 10 to 5. Well worth a visit- bring the kids and maybe I can sell you a token or two.